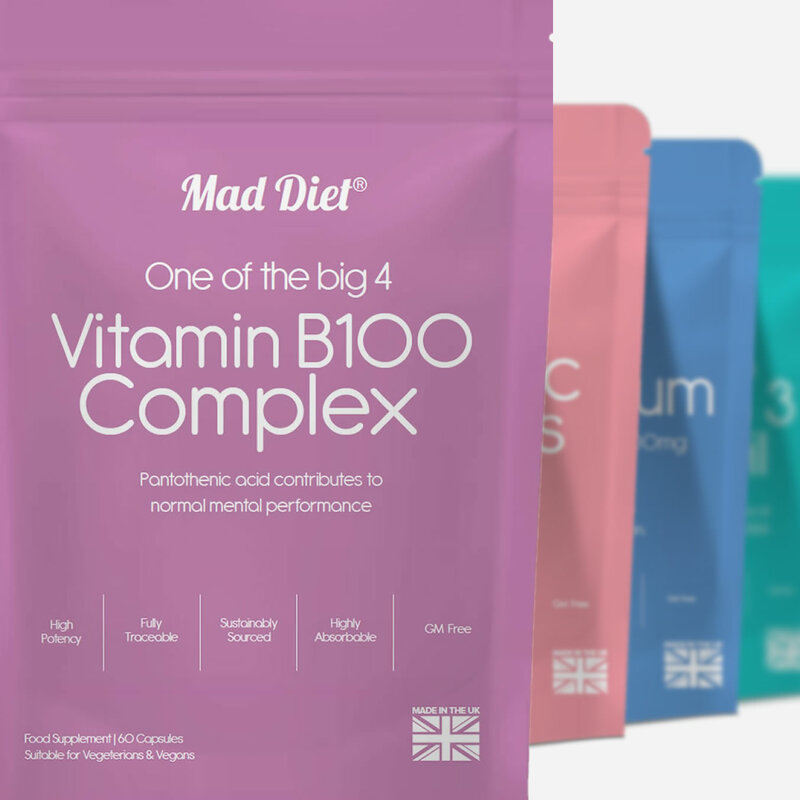 Mad Diet offers a practitioner-quality range of food supplements specially designed to help boost immunity and support mental health and metabolism. When taking supplements it's important to choose ones which don't contain hidden nasties! Mad Diet micronutrients are free from genetically modified ingredients, cheap fillers, and other undesirable additives, which is why Mad Diet products are recommended by leading healthcare practitioners and trusted by thousands of people. Also, they come in recycled paper pouches instead of plastic tubs so are better for the environment too! Unlike most other brands, the Mad Diet micronutrients are not manufactured by big drug companies. They are produced in one of the very few remaining independently owned GMP certified facilities in the UK . This gives greater control over the supply chain and ensures ingredients are fully traceable, sustainably sourced, and produced to the standards of the Medicines & Healthcare products Regulatory Agency. Not only that they are available at considerably less than many other brands. Buying supplements is just like buying food and quality really matters! Multivitamins usually perform badly in clinical trials as the dosage is often too low to correct deficiencies and popular brands in the shops often contain suboptimal ingredients or inferior formulations that are poorly absorbed. Premium brands can be expensive and out of reach for those on a tight budget. That’s why Mad Diet have set a new standard in food supplements by offering quality micronutrients at an affordable price - sometimes half or even a third of the price of comparable practitioner-quality products. Use the code maddiet10 at the checkout to get 10% of your purchase. Vitamin D is known as the sunshine vitamin as we produce it from exposure to the sun. But if you live in the UK the latest health advice is that everyone should be taking vitamin D in the winter months. And in cloudy Scotland we may require a supplement all-year round. This powerhouse nutrient helps maintain bone health but is also controls an enormous number of our genes, including some associated with cancer, autoimmune disease, and infection. Low vitamin D levels are also linked to mental health problems and you’ll find a long list of studies in the Mad Diet book. 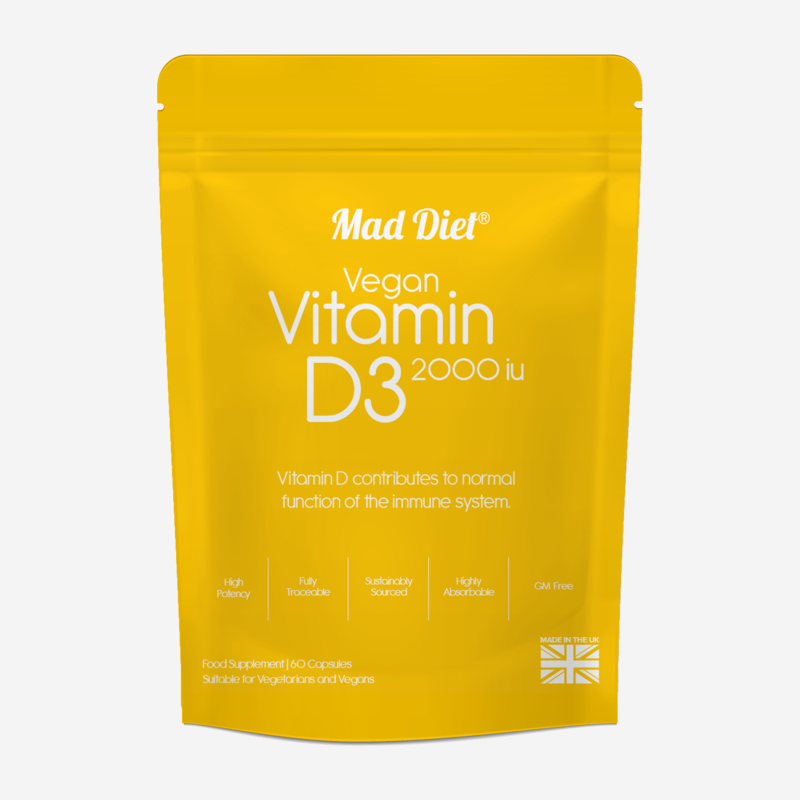 Click here to buy Mad Diet Vitamin D3 and use the code maddiet10 at the checkout to get 10% of your purchase. B vitamins are essential for every aspect of brain function. Without a steady supply of these water-soluble micronutrients, which the body doesn’t store, we face a higher risk for depression, anxiety, cognitive decline, memory loss, and neurodegenerative diseases like Alzheimer’s. Vegans and vegetarians are particularly susceptible to certain B vitamin deficiencies, especially B12 as we can only get that nutrient from animal products. Folk taking certain medications, like metformin for treating diabetes or proton pump inhibitors for acid reflux may also be at risk as these drugs can deplete the body of B vitamins. Most B-complex supplements contain cyanocobalamin – the synthetic form of B12 that contains a cyanide molecule and is poorly absorbed. Popular high street brands often contain genetically modified soy lecithin, synthetic polymers, and carnauba wax, and at a dosage that may be too low to correct deficiencies. The Mad Diet B100 Complex is a high strength formula designed to support adults suffering from low mood, low energy, and symptoms of depression. Our formula contains methylcobalamin, the natural form of B12, and studies show when taken with folic acid, this combination is better absorbed than other formulations. The caplets can be easily halved for those who require a B50 dose. Suitable for vegans and vegetarians. Click here to buy Mad Diet B100 Complex. Use the code maddiet10 at the checkout to get 10% of your purchase. Magnesium oxide tablets are the variety most frequently sold in supermarkets and pharmacies but they are poorly absorbed by the body. By far the most bioavailable oral preparation is magnesium citrate but many brands contain a long list of unnecessary additives and tablets are often coated with titanium dioxide. 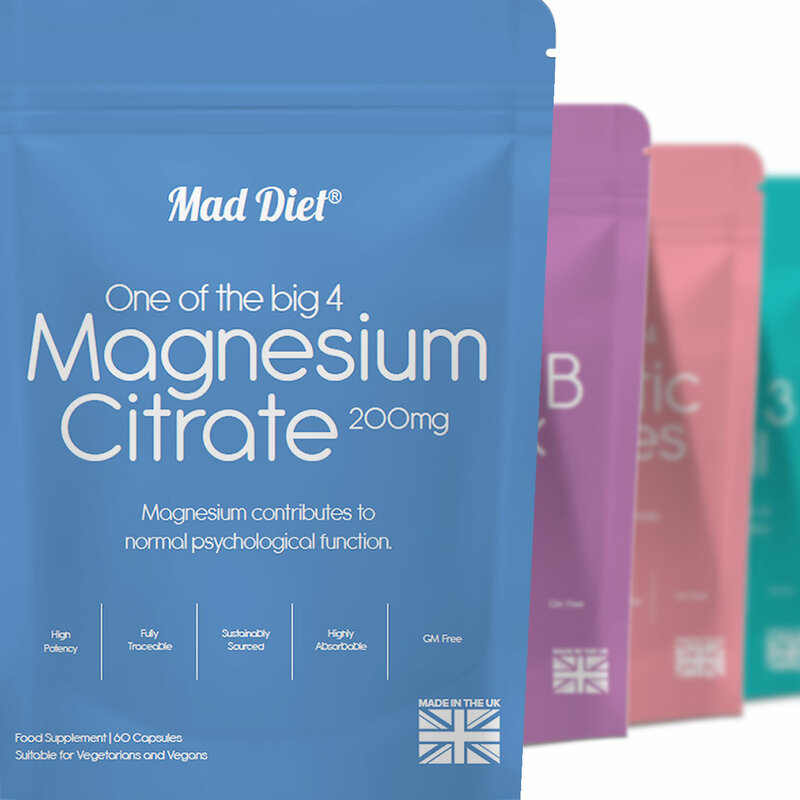 The Mad Diet Magnesium citrate capsules contain just 3 ingredients at a dosage of 200mg to help plug the gap between what we are consuming and where we need to be. Magnesium is also required for calcium absorption and for our bodies to metabolise vitamin D. You can learn more about how these nutrients interact with each other in the Mad Diet book. Magnesium is the ultimate ‘chill pill’ and the wonder supplement everyone should have in their medicine cabinet. It is needed for more than 300 biochemical reactions in the body but today up to 80% of us don’t get enough. We need between 320mg to 450mg per day yet studies show most of us consume less than 250mg per day! Our ancestors would have consumed plenty of magnesium in seafood, organ meats and by drinking water straight from the stream or absorbed through the skin when swimming in the sea. But our diet and activities are very different today. Due to intensive farming soil is depleted of minerals, tap water has been stripped of magnesium during processing, and many of our staple crops have seen a marked decline in magnesium. Magnesium is also required for calcium absorption and for our bodies to metabolise vitamin D. You can learn more about how these nutrients interact with one another in the Mad Diet book. Magnesium oxide tablets are the variety most frequently sold in supermarkets and pharmacies but they are poorly absorbed by the body. By far the most bioavailable oral preparation is magnesium citrate but many brands contain a long list of unnecessary additives and tablets are often coated with titanium dioxide. The Mad Diet magnesium citrate capsules contain just 3 ingredients at a dosage of 200mg to help plug the gap between what we are consuming and where we need to be. Click here to buy Mad Diet Magnesium citrate. Use the code maddiet10 at the checkout to get 10% of your purchase. A major pitfall in the modern Western diet is that our omega-3 to omega-6 ratio is now way off-kilter. We eat two-thirds less fish than we used to and farmed fish has fewer omega-3 fatty acids compared to wild varieties. Changes in livestock production and animal feed has altered the chemical structure of meat, and with millions of people switching butter and lard (rich in omega-3) for vegetable oils (high in omega-6) we often don’t consume enough DHA and EPA in our diet. Sixty per cent of the brain is made of fat. Forty per cent of this fat is long-chain polyunsaturated fatty acids (PUFAs) and DHA is the most abundant omega-3 fatty acid in the brain. It’s a no-brainer as to why omega-3 is so important for brain health. If omega-3 is a primary structural component in the brain then this fatty acid should be a key part of our diet if we want to stay sharp and free from depression or other mental health problems. It is widely accepted that almost all disease (including mental illness) starts with inflammation. Omega-3 is a powerful anti-inflammatory so it makes perfect sense to ensure we get enough of these essential fatty acids. Many over-the -counter fish oil supplements are marketed as 1000mg but often only a small proportion of the dosage is made up of the active ingredients DHA and EPA. Popular brands also include mixed tocopherols derived from genetically modified crops. 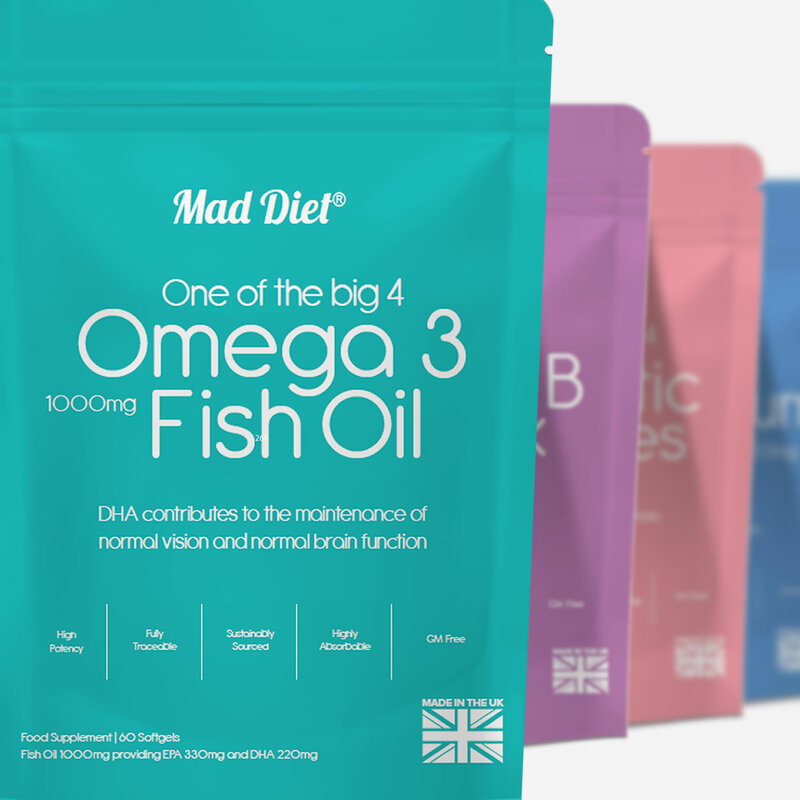 Every Mad Diet Omega 3 Fish Oil softgel contain 550mg of DHA/EPA which is often double or sometimes triple the strength of other supplements. Our pharmaceutical-grade fish oils are sourced from sustainable stocks of sardines and anchovies in the South Atlantic and fully screened for mercury and contaminants. Click here to buy Mad Diet Omega 3 Fish Oil. Use the code maddiet10 at the checkout to get 10% of your purchase. The Western diet, and over-use of antibiotics, is killing the ‘good bacteria’ in our gut. Antibiotics are widely used to treat livestock and often sprayed on crops. Chemicals and artificial ingredients added to processed food can also destroy gut-friendly bacteria. These tiny little microbes can influence whether or not we suffer from, or are saved from, conditions like heart disease, diabetes, depression and even obesity but the modern Western diet disrupts the diversity of bacteria living in our intestines and puts us at risk of a wide range of health issues. Good bacteria increases levels of tryptophan, an amino acid required to produce serotonin in the brain – the happy hormone. Plus the different species of gut bacteria are essential for digestion and the production and absorption of vitamins. Microbes also affect our mood. Studies have shown that even minute doses of certain bacteria in the gastrointestinal tract are capable of influencing neurotransmission in the hypothalamus the part of our brain which regulates mood and emotions. Most probiotics sold in the shops are not encapsulated which means it is difficult for the bacteria to survive stomach acids. Many brands also contain genetically modified carrier ingredients or dosages that are very high or too low. 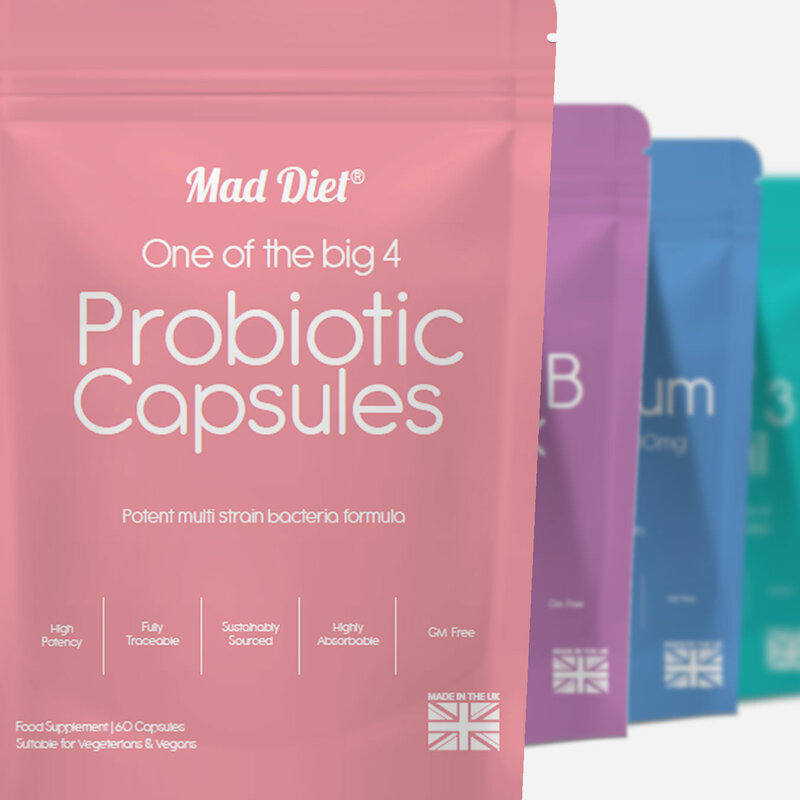 The Mad Diet probiotics contain 6 specially selected strains of bacteria that have been shown to help improve mental health in clinical trials. With a non-GMO carrier, each capsule contains over 5 billion active cultures and designed to take one per day. Lactose and Gluten free. Suitable for Vegans and Vegetarians. Click here to buy Mad Diet Probiotics. Use the code maddiet10 at the checkout to get 10% of your purchase.